To acquire my work or commission a piece, contact the Stonington Gallery by clicking the button at the top of the page. 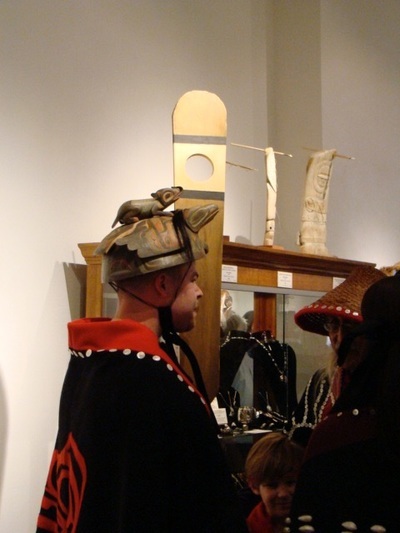 This helmet and bentwood visor represent a warrior and a kushtaka. It is carved out of alder wood and the visor is yellow cedar. The teeth are snail operculum and it has human hair. In Nov. 2017 Courtney and I had a collaborative show "Reflections" at the Stonington Gallery in Seattle. This is a series of small masks my wife Courtney and I created in 2015. 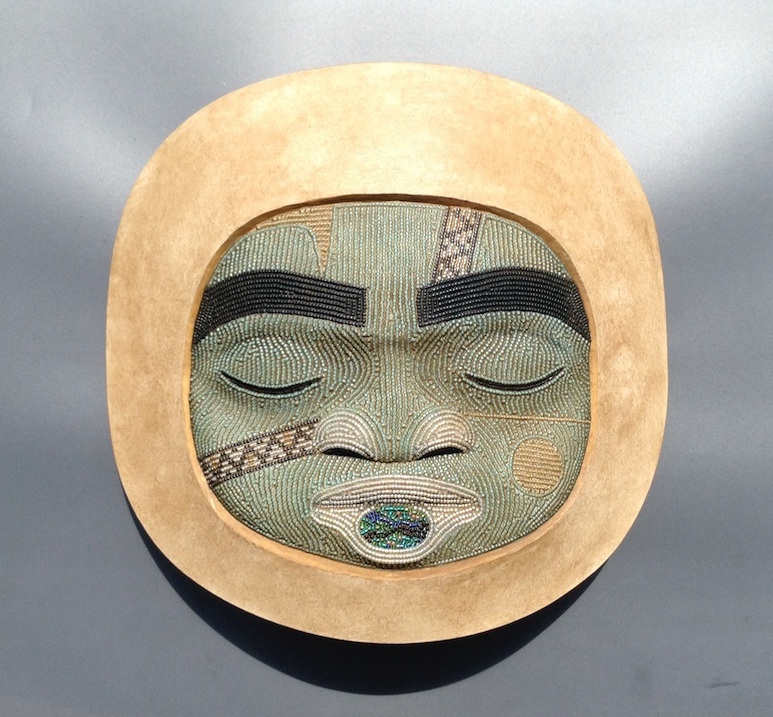 I carved the wooden masks and she inlaid the micro-mosaic in tiny seed beads that cover the faces. 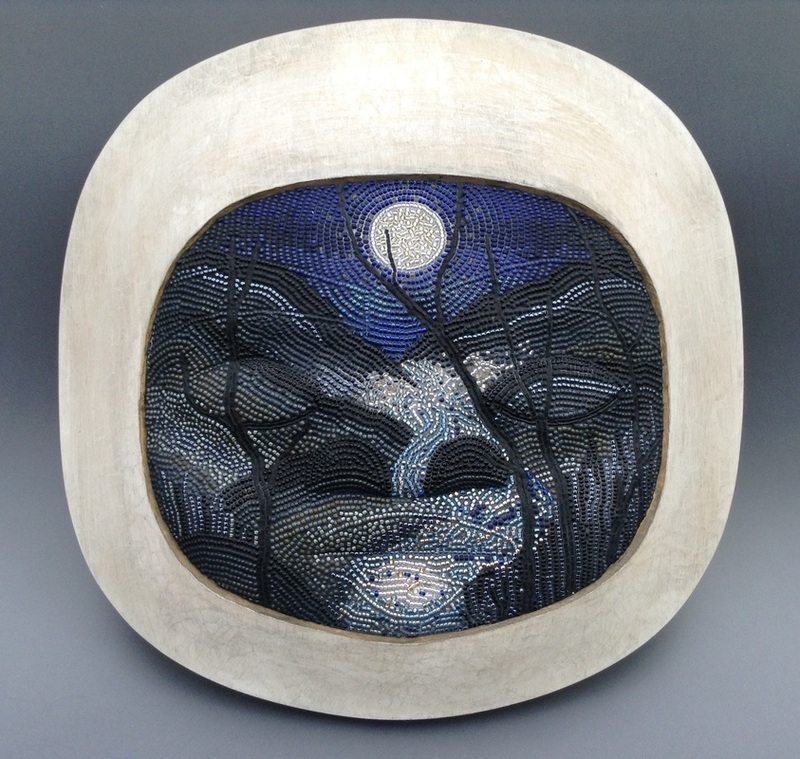 The two images above show two variations on the theme, "Moonlight on the Nooksack", a river near where we live. The image below is a close up of the mask shown above left. 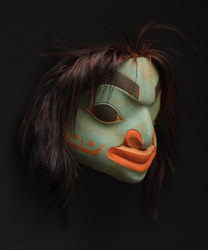 The two masks below are similar in face paint decoration. We gave one the look of abalone shell inlay using beads and the other one has Raven's Tail weaving patterns using beads in the face paint. All the masks are 7 1/2 " high. You can see some in-progress images of this piece on the "My Current Project" page on this site. Three views of another piece Courtney and I collaborated on this year. It was made to bring attention to the health of the rivers and the salmon on Washington State's Olympic Peninsula. Rivers like the Ozette, Elwha and Quinault. The mask is carved in the style of the Quinault First Nations people that have lived in that area for thousands of years. Along with the beads Courtney usually uses in her work, for this piece she collected and added small river stones. Among the stones she placed carnelian beads that represent salmon eggs. The following eighteen masks were created as part of a Stonington Gallery exhibit "Facing The Coast"
Photography for this show by Alec Miller Arts. This is my interpretation of the cannibal giant story. This is a collaboration with my wife Courtney. You can see more details about this mask on my current projects page. Mask of a human with a raven coming out of the mouth and a bullhead "a type of fish" on its forehead. This headdress is made of yellow cedar with abalone inlay. It is carved with the image of a shaman, spirit helper and an octopus. The mask shows a shaman with land otter spirit helpers. These hats originate from the Bering Straits area between Alaska and Russia. They are made from a flat piece of wood carved to varying thicknesses, then steamed and bent into shape. The traditional decoration consists of paint, ivory, sea lion whiskers, feathers and beads. I replaced the ivory with wood and used simulated sea lion whiskers for legal and conservation purposes. Alder wood and human hair. A view of the back of the headdress showing the raven's tail. This hat is inspired by several old hats that were collected in Alaska and are now housed in museums. The carving represents a mountain goat. 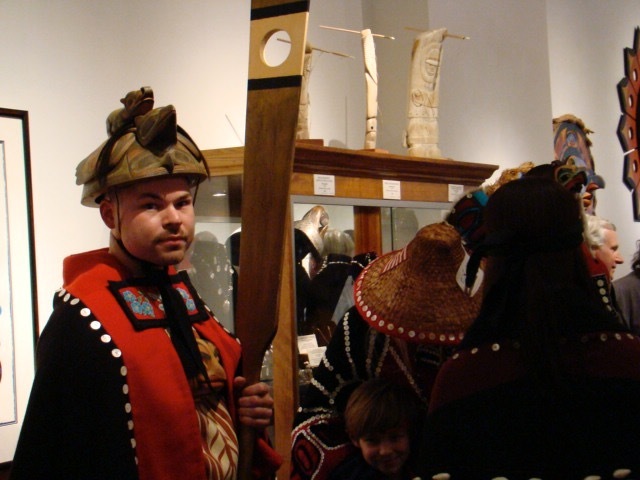 The hat itself is a portion of Chilkat weaving made by my wife Courtney, and the fur is buffalo. A dragonfly is such an incredible looking insect and I love the way it was interpreted by the Tlingit and Haida in their art. I made this rattle because I am drawn to both the real and artistic image of this insect. Visit the inspiration page. This bowl is made of alder wood and is 29" long and 11 1/2" wide. 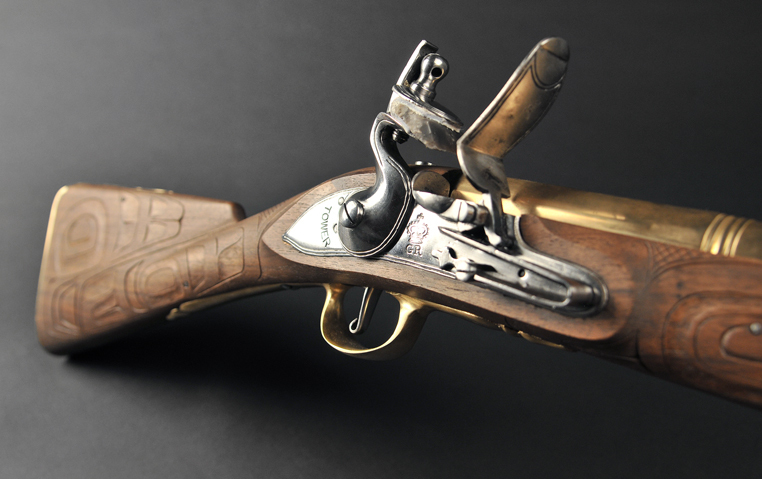 It has an eagle design carved in shallow relief on the sides. A small Spirit face is carved above the bear's tail. One of the most common themes for bowls on the northwest coast was a seal. Most often represented as this one is with it's belly on the ground and it's head and tail raised. If you travel in Southeast Alaska near any of the glaciers during the pupping season you will see many seals hauled up on the icebergs in this same pose. Seal bowl showing the flippers tucked around the back of the bowl. The bowl is 13 1/2" long x 7" high. 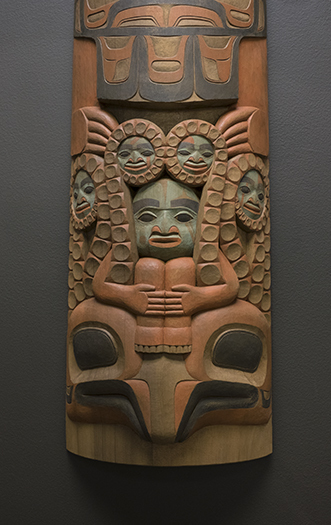 This is the carved wooden plaque that is part of a headdress that is worn by most of the native groups along the northwest coast from Vancouver, B. C. to Southeast Alaska. 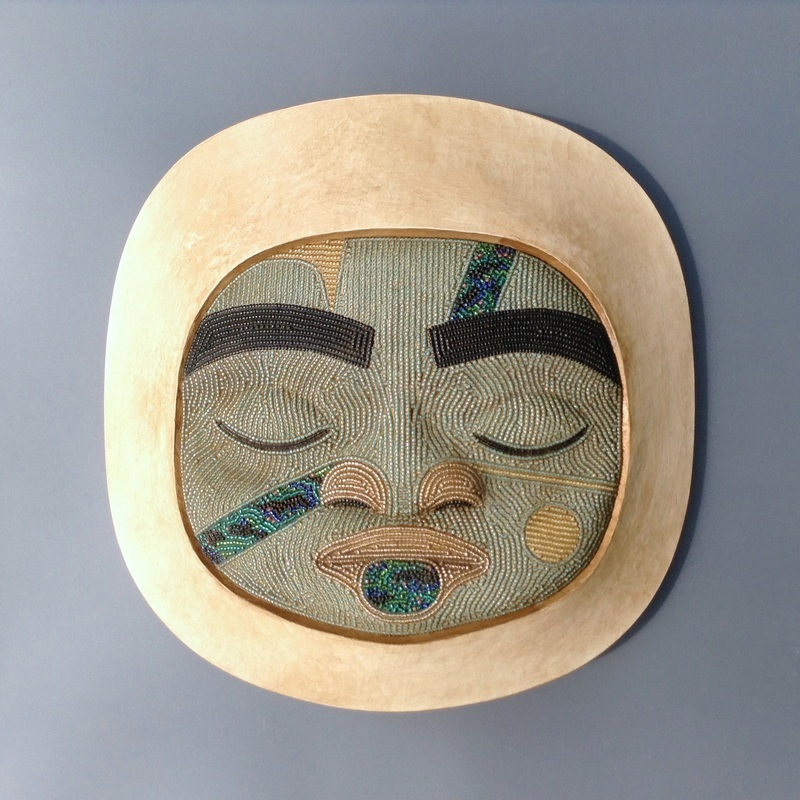 This piece is made of yellow cedar, inlaid with abalone shell and the eagle is holding an adz and crooked knife. 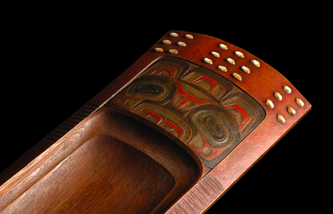 The adz and crooked knife are traditional northwest native carving tools. 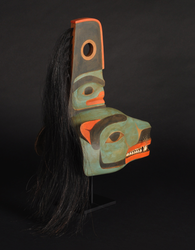 This carving was influenced by the style of a northern Tlingit master carver from long ago. 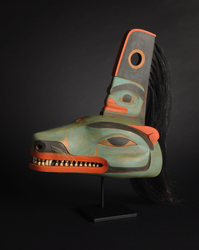 Some of his work still exists today and can be seen at the museum in Wrangell, Alaska. 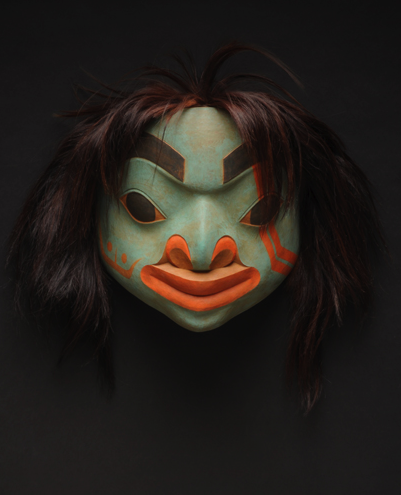 There are also reproductions of his work at Chief Shakes House in Wrangell, Alaska. Height 9 ft. I know this is different for me but I have always loved the incredible work done by the people of the plains. I just had to try my hand at it. I am drawn to the beading style of the Crow. This is my attempt to do something close . I used brain tanned buckskin, seed beads, pony beads, horse hair, trade cloth, conch shell and ermine skins.